It would take “a 55th cousin to P. T. Barnum to sell this picture.” That was Colonel Parker’s take on Harum Scarum in a letter to MGM prior to the film’s release in November 1965. Well, who am I to disagree with the man who engineered the finances-first-creativity-be-dammed Hollywood contracts for Elvis Presley. 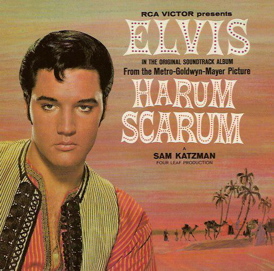 I know there are some loyal Presley fans out there who actually like Harum Scarum, but I’m one loyal Elvis fan who has trouble finding anything positive to say about this movie. At age 30, Presley had reached a low point in his film career. Presley’s lack of enthusiasm is painfully evident in the film, as he moves listlessly from scene to scene. Elvis had made some weak movies before, but at least he seemed to be enjoying himself on screen. Not so here. He barely even moves during his nine musical numbers, and the screenplay provided few opportunities for the star to flash his famous smile. Vincent Canby reviewed his first Presley picture for the The New York Times on December 16, 1965. In it his irritation at having to sit through a dull double feature was obvious. “’Something terrible is about to happen’ mutters an inscrutable Japanese actor early in ‘Ghidrah, The Three-Headed Monster,’ and during the next three hours his prophecy comes only too true. 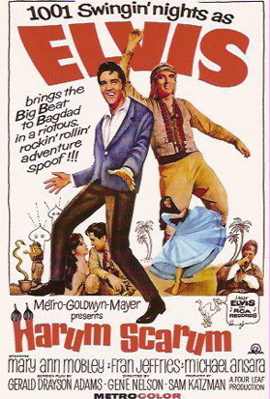 "It is hard to imagine a more perfect blending of witlessness than this double bill of ‘Harum Scarum,’ the latest Elvis Presley vehicle, and ‘Gihidrah,’ an all-star Japanese monster film … Elvis is prettier than Ghidrah, and has two fewer heads, but both characters are definitely the product of the special effects department. 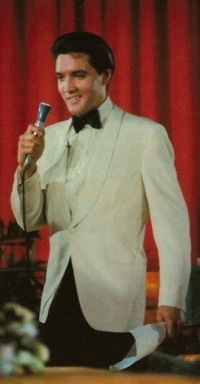 Unfortunately, even Elvis’s musical numbers, which helped salvage several earlier Presley films, don't help this one. Guralnick calls the collection of nine tunes, “an embarrassingly mediocre soundtrack.” Most are bland ballads, performed stoically on screen by Elvis. Even the few uptempo numbers don’t receive the singer’s usual wholehearted treatment. 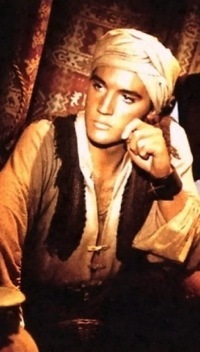 Elvis looks handsome in his Arab getup, and he certainly has a harem full of scantily clad women adoring and adorning him. In particular, according to Variety, “Mary Ann Mobley is a pretty princess” and “Fran Jeffries torches up her femme heavy role.” But heavenly bodies were not enough to save this film. Unfortunately, Harum Scarum’s intended spoof is lost in too many scenes that are played straight. Michael Ansara and Phillip Reed portray their roles of Prince Dragna and King Torenshah entirely too seriously. Even Elvis fluctuates back and forth between comedic and dramatic modes. The inconsistency of the film’s mood was the result of a weak screenplay and a hasty film schedule (it was shot in just 18 days) imposed on the director and actors in order to keep expenses low. Creativity had no chance to flourish in the finances-first environment created by Colonel Parker and producer Katzman. 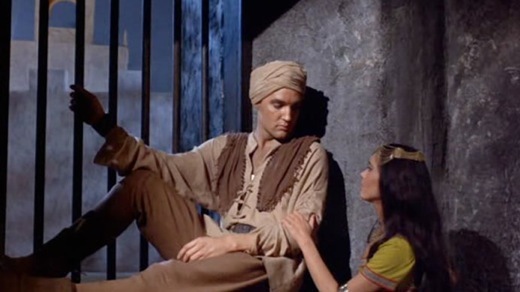 "Elvis looks handsome in his Arab getup, and he certainly has a harem full of scantily clad women adoring and adorning him … But heavenly bodies were not enough to save this film."